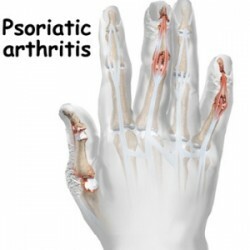 When it comes to psoriatic arthritis, this is a form of arthritis that will usually affect individuals who suffer from psoriasis (a condition which causes red patches of skin to form topped with silvery scales). The majority of individuals will first of all be diagnosed with psoriasis and later on they’ll get to suffer from psoriatic arthritis, yet in some cases, joint problems can appear prior to the skin lesions. The main symptoms of psoriatic arthritis are joint swelling, stiffness and pain and they can affect any part of the body, including the spine and the fingertips, while in terms of severity it can be very severe or mild. Regardless if someone is suffering from psoriatic arthritis or psoriasis, periods of remission will alternate with disease flares. If it’s left untreated, the disease can be disabling. Both psoriasis and psoriatic arthritis are chronic diseases, which means that over time they will get worse, yet people will have periods in which their symptoms will go into remission or improve. 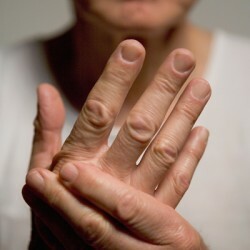 Psoriatic arthritis will affect the joints on both sides of the body or only those on one side of the body. Lower back pain: As a result of psoriatic arthritis some individuals will develop a condition known as “spondylitis”. This will usually cause inflammation in the joints between the pelvis and the spine and between the vertebrae of the spine. Foot pain: Pain caused by psoriatic arthritis may also appear at the points where ligaments and tendons attach to the bones. This is more likely to appear in the sole of the foot or at the back of the heel. Swollen toes and fingers: Psoriatic arthritis may cause a strange type of swelling of the toes and fingers which will make them look like sausages. Before having significant joint symptoms, people may also develop deformities and swelling in their hands. Everyone who is suffering from psoriasis should inform their doctor as soon as they develop joint pain. When it comes to psoriatic arthritis, it can develop slowly but it can also appear suddenly and in either case, if left untreated it will greatly damage the joints. Psoriatic arthritis will occur when the individual’s immune system starts attacking healthy tissue and cells. Due to the abnormal immune response, there is an overproduction of skin cells and inflammation in the joints. Doctors don’t really understand yet why the immune system turns on healthy tissue, but they believe that both environmental and genetic factors play a role. Also, many of those who suffer from psoriatic arthritis have or have had someone in their family who suffered from a form of psoriasis. Age: Most of the times people aged between thirty and fifty years old will suffer from it, but anyone can develop psoriatic arthritis. Family history: Many of those who suffer from it have a sibling or parent with the disease. Psoriasis: The greatest risk factor for developing psoriatic arthritis is for the individual to suffer from a form of psoriasis. 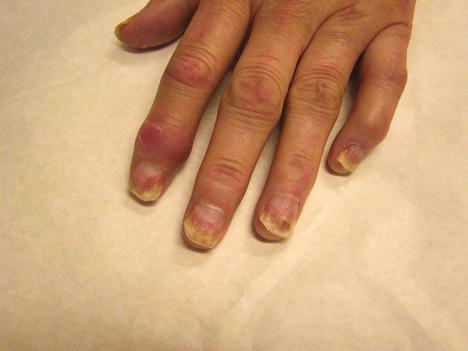 Psoriatic arthritis will have a greater chance of incidence in people who have psoriasis lesions on their nails. DMARDs or disease modifying anti-rheumatic drugs. NSAIDs or non-steroidal anti inflammatory drugs. Those who suffer from severe psoriatic arthritis will be prescribed tumor necrosis factor alpha inhibitors by their doctor. These drugs are really effective and the way they work is by blocking the specific protein causing inflammation in various types of arthritis. At the same time, they also improve the symptoms and signs of psoriasis. However, people need to be aware that using these drugs they’ll expose themselves to a series of serious side effects, with some of them being life threatening. That is why before taking them, it’s best to seek advice from their doctor. Because they have dangerous side effects linked to them, it’s recommended that people use immunosuppresants only if they suffer from a severe case of psoriatic arthritis. Side effects include kidney and liver problems, but also an increased risk of severe infection and anemia. These drugs are very helpful for reducing the amount of joint damage in people suffering from psoriatic arthritis. However, they will act slowly which means that people will notice their effects in weeks or even months after they start taking them. Trexall or Methotrexate is currently the most popular DMARD, but it bears serious side effects such as liver, kidney and lung problems. Controlling stiffness and pain is usually achieved by using drugs such as Anaprox, Aleve, Motrin, Advil and others and they’re generally the first ones doctors recommend for psoriatic arthritis. They are highly potent compared to OTC drugs, yet long term use can cause gastrointestinal bleeding and can irritate the intestine and stomach. Psoriatic arthritis is currently a mystery for doctors in terms of finding a cure for it, but because there are plenty of other drugs out there sufferers can use, they’ll be able to control their symptoms and reduce pain. Before taking any drugs, it’s best for those affected by psoriatic arthritis to consult with their doctor. By taking swift action they’ll avoid receiving too much damage to their joints which can severely affect their day to day life. you do not mention the benefits of diet in dealing with psoriatic arthropathy? I have moved to a whole-food plant based diet an almost all my symptoms are gone, and quite soon I will be off drugs, forever.